Saturday 4th of March heralds the prettiest day of the year for bike racing. Strade Bianche, with its white gravel roads, rolling Tuscan hills and the beautiful hosting town of Siena, is a real highlight of the yearly cycling calendar. The gravel isn’t as unforgiving as the cobbles of Belgium or northern France but it is still riddled with hazards. In dry conditions, there’s choking dust, unstable ground and puncture-inducing stones. In the wet, there’s cloying white clay, slippery slopes and puncture-inducing stones. Whatever the conditions, a gravel section can exacerbate the smallest of gaps between riders and cause a race to be won or lost 60km from the finish line. One of the shorter one-day classics at 175km, a factor that aids the fast tempo and dynamic racing, this year’s race will include 11 gravel sections, making up 62km of the race. 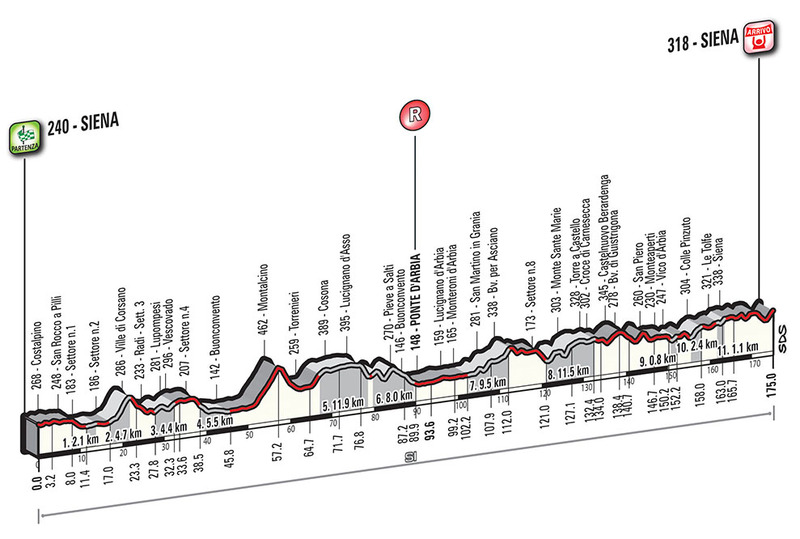 The peloton will have only just left Siena and entered into the Chianti countryside, before the first of these sections presents itself, neatly coming in at 11km, after which the first, and steepest gravelled climb comes 17km. 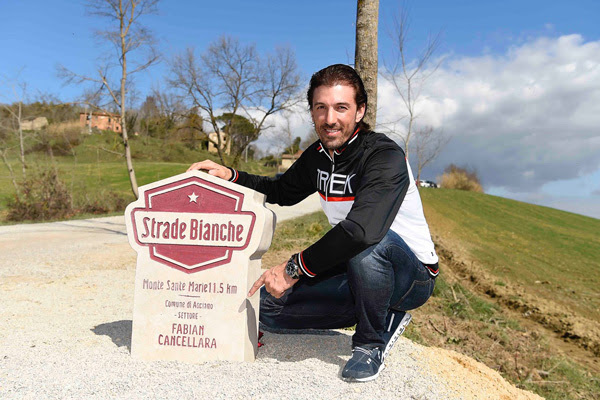 The rider then cover two more sections of gravel including the Monte Sante Marie, which has been dedicated to 3-time winner Fabian Cancellara. The big test comes some 30km after this, in the form of the climb to Montalcino (4km at 5%). However, its early appearance in the race means it has little chance of appearing a race defining split. After this comes two significant gravel sections, separated by barely a km in between. After this, the remainder of the race profile resembles the read out from a nervous polygraph subject, that undulates without extreme severity. As the race reaches the penultimate section of gravel, steep stretch up to Colle Pinzuto, expect the hopeful race-winning attacks to be launched. After this, the final sections of gravel, with another punchy climb halfway through it, will then leave only 12km to the finish and the lead group of riders will have Siena in their sights. This is arguably one of the finest finishes in professional cycling: The sharp upward roads, leading to the tight city streets, lined by the terracotta coloured medieval buildings, leading to the finish line in the Piazza del Campo – Bellissimo! Similar to last weekend’s Omloop Het Nieuwsblad it has UCI world tour status for the first time this year which means it was even easier to attract the big teams and so, like the best spring classics, the lineup is full of excellent riders. Here we focus on the guys we think will really have a crack at it tomorrow. Greg Van Avermaet (BMC) – Of course he’s a favourite here. He took Omloop, finished 7th the next day at KBK and has a mightily strong team around him including the Italian duo of Daniel Oss and Damiano Caruso who will be looking forward to racing on home gravel. Peter Sagan (BOH) – His form here at Strade Bianche in the past 4 years has got him two second places and a fourth place finish. His form last Saturday and Sunday was second and first respectively. He will be in the choice group making the decisive moves, and if he can get up that last street climb better than he has in the past years, this race is his. Vincenzo Nibali (TBM) – With a victory at Il Lombardia and impressive, punchy stage wins in grand tours under his belt, Nibali shows that when he isn’t concerned with a general classification position he can race a one-dayer as well as the best. Giovanni Visconti will be a very useful teammate here. With a top three finish at last year’s Il Lombardia, Rigoberto Uran (CDT) could factor in the final moves but he’ll probably be riding for his teammate Sep Vanmarcke. Simon Clarke will also be acting as a very handy domestique. Previous winner Zdeněk Štybar (QTS) will be wanting to make up for QuickStep’s poor luck in last weekend’s Belgian races, and without Tom Boonen being the de-facto team leader, Zdeněk can call all the shots. With a team also featuring Matteo Trentin and Gianluca Brambilla, QuickStep are here to win. Michal Kwiatkowski (SKY) will want to summon the fearless form that led to his victory in 2014. A form that one could argue hasn’t been recreated in Team Sky colours, but with a strong Italian trio of Salvatore Puccio, Diego Rosa and Gianni Moscon backing him up, he’s going to try his damnedest. Trek-Sefafrado are seemingly not struggling with life without Cancellara, with both Jasper Stuyven and Fabio Felline looking in great shape after the opening classic weekend in Belgium. Both look able to challenge for the win here, but we think the Italian will be favoured on home roads. Notable others: Tiesj Benoot and Jurgen Roelandts (LTS), Enrico Battaglin (TLJ), Edvald Boasson Hagen (DDD), Georg Preidler (SUN). When discussing this preview one of us joked we could sum it up in one word: Sagan. Another joked we could sum it up in three letters: G.V.A. No no no, you’re wrong, said the last pundit, two words: Fabio Felline. Wait, what?